We’re constantly getting asked by our guests and even some of our less well-informed friends about where to buy the best haggis in Edinburgh. Now obviously you could go hunting on the Pentland Hills and catch your very own haggis, but if like us you’re not a fan of physical exercise and/or chasing after mythical creatures, then read our guide for the top places to get haggis in the city. DISCLAIMER: If you continue to read to the end of the post then we will tell you what exactly is in a haggis so if you’d rather not know then look away now. You have been warned. Crombie’s on Broughton Street is undoubtedly one of the best butchers in Edinburgh and their haggis is second to none. We recommend visiting the shop and chatting to one of their staff who will tell all you need to know about cooking a haggis. Or if you’d rather not reveal your ignorance then check out their cooking instructions online. Alternatively, if you’re looking for something less pricey then MacSweens haggis is probably one of the best brands you can buy in most of the big supermarkets. After all, they don’t call themselves the ‘Guardian of Scotland’s National Dish’ for nothing. They also sell a vegetarian version which happens to be suitable for vegans too. And if for some reason there’s been a run on haggis in the capital then we recommend a couple of other good Edinburgh butchers – Saunderson’s on Leven Street and George Bower’s in Stockbridge. If you’re not feeling up to the task of cooking your own haggis, neeps and tatties feast then there are plenty of restaurants in Edinburgh that serve this classic Scottish dish. We’ve listed a few place that we’ve tried or have heard come highly recommended but feel free to get in touch with any additions. Whiski Rooms, 4-7 North Bank St. This eatery is a relative newcomer to the Edinburgh restaurant scene but it’s already become a favourite with locals and tourists alike. 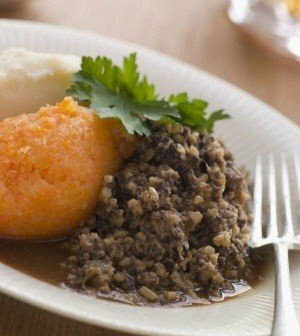 The haggis here is tried and tested by us, is very tasty, and affordable to boot! Arcade Haggis and Whisky Pub, 48 Cockburn St. The only pub in Edinburgh dedicated purely to the magic combination that is haggis and whisky. One for visitors to the city as no doubt they’ll give all their customers the full Scottish experience. Walter Scott Tea Room, 62 Princes St (part of Romanes and Paterson’s). This traditional cafe is exceedingly Scottish without trying to be and serves traditional MacSweens haggis with oatcakes at very reasonable prices. The perfect place to go if you want to try haggis without sitting through a long meal. Vegetarians and vegans are catered for at The Auld Hoose, 23-25 St Leonard’s St, and for a Tanzanian twist, you can buy vegan haggis samosas from The Baked Potato Shop, 56 Cockburn St.
Lastly the creme de la creme of Edinburgh’s eateries, Wedgwood the Restaurant, 267 Canongate is the place to go if you’ve got money to burn and want a very original haggis experience. You might disagree but the rare pigeon breast served with haggis, neeps and tatties sounds delicious. It’s even recommended by The Guardian. It’s really nice – honest! Play the ‘Whack a Haggis’ game. ← The Irish are coming….